It's easy to get lost in Siam Paragon's spacious marbled hallways. Five vast floors make it a consumer 'heaven' with boutiques and flagship stores of the world's top-notch designer names like Gucci, Prada, Louis Vuitton, Dior, Versace, Burberry and Hermes. Floors are divided into Luxury Living, Fashion Venue, Lifestyle & Leisure, Living & Technology, IT & Paragon Passage, and Explorium & Global Entertainment. And that's not even counting the world-class aquarium, Siam Ocean World on the basement floor, or the stylish restaurants, Gourmet Market and Food Hall on the ground level. At the base of each escalator are information directories, but it is advisable to get your hands on a map from the information desk on the ground level before you start your shopping excursion or exploration. 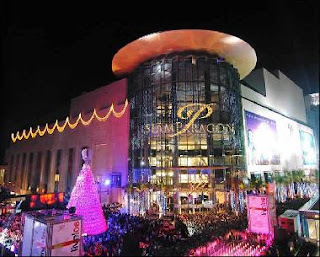 Created as a national showpiece strategically located in the heart of Bangkok, Siam Paragon effectively enhances the Thai capital's status as a world-class destination for a supreme shopping and entertainment experience. From the moment you arrive at Siam skytrain station with your first view of the imposing complex, also dubbed 'The Jewel of Asia', it is evident that an unrivaled retail experience awaits. Envisioned by a team of 100 renowned international and local architects and designers, Siam Paragon has become a landmark that beautifully blends consumer culture and remarkable design with state-of-the-art technology. Lighting features, its spaciousness and the temperature-controlled environment makes it the ideal escape from the city's manic pace - and the heat! The Siam area is after all known as Bangkok's unofficial core and the start of the city's 'Shopping High Street'; and home also to other famous malls like Siam Centre, Siam Discovery, MBK and the busy Siam Square area with a host of shops, independent designer boutiques and restaurants. Apart from the demarcated shopping floors where you can find anything from cutting edge fashion and beauty products, jewellery, audiovisual equipment, watches, art and handicrafts to digital technology, sports cars, trendy interior shops and luxury lifestyle products, the Paragon Department Store is a real treat. Boasting 80,000 square metres, this elegant shopping paradise offers exclusive selections of top-quality products from Thailand and the world's leading brands - from flashy trends to novel technology and other distinctive things that represent complete elegance and a supreme lifestyle. This includes a Beauty Hall, Shoes and Bags Salon, Accessories Bazaar, Lingerie Salon, a Sports Mall, Paragon Kids and Men's and Ladies' Fashion, amongst others. With so much shopping on the cards, there's no need to go hungry... Taste and experience culinary delights from all over the world that are served up at the ground level, Bangkok's biggest food destination. This 20,000 square metres space with some 80 restaurants and food outlets are divided into five areas: Gourmet Market, Take Home, Food Court, Food Hall Gallery, and the Food Hall. The Gourmet Market, a definite highlight, is divided into Gourmet Grocery and Gourmet Fresh, packed with the best quality, chemical-free local and imported fresh produce and delicatessen. Some even say that it rivals the famous Food Hall of Harrods in London. In the Food Court and Food Court Gallery there are well-known Thai, Chinese, Indian and Japanese restaurants, as well as cuisine from every other corner of the globe, many of them where the food is prepared and served from open kitchens. The Food Hall is home to many famous food brands, mostly fast foods which can be enjoyed in the huge, upmarket cafeteria-like area. And to burn off all those newly-acquired calories, a super-modern California Wow Fitness Centre has just opened its doors. Given the fact that Siam Paragon has proclaimed itself as the 'Pride of Bangkok', its Food Hall accordingly lives up to the hype. Covering a good half of the mall's huge ground floor, the Food Hall is divided into three different zones: Food Hall Food Court, Food Hall Gallery, and Food Hall Take Home. 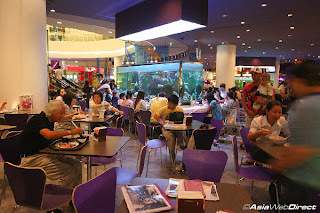 Food Hall Food Court is arranged in a crescent-like fashion with a sizeable aquarium standing in the middle (a sneak preview perhaps of the much larger tank one level down at Siam Ocean World?). But wait, there's more... The 15,000 square metres Royal Paragon Hall is used for exhibitions and conferences, while the Explorium, Edutainment Centre and Entertainment complex on the top floor is home to a world-class cinema and other features that will delight young or old. 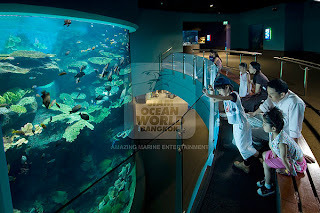 On the basement floor, Siam Ocean World - the biggest aquarium in Asia - offers seven sections: Weird and Wonderful, Deep Reef, Living Ocean, Rain Forest, Rocky Shore, Open Ocean and Sea Jellies. There are see-through tunnels you can walk through to experience and admire the wonders of Marine life first-hand, including sharks, a giant grouper, stingrays, giant crabs, star fish, jellyfish - to name but a few. Audiovisual presentations offer informative explanations of the different displays. Two storeys underneath the glitzy Siam Paragon shopping mall, an aquatic wonderland the size of three Olympic swimming pools awaits your discovery at the Siam Ocean World. This underground aquarium, one of the largest in Southeast Asia, will dazzle you with innovative world-class exhibits and over 30,000 curious looking creatures from various depths and aquatic regions across the globe.